Explore Canada's beautiful Laurentian Mountains on this day trip from Montreal. 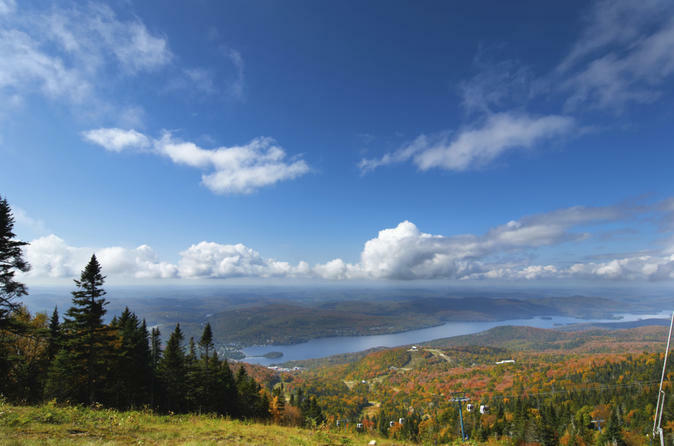 As you make your way along narrow country lanes that crisscross the scenic alpine landscape, admire views of the mountains — including 2,871-foot (875-meter) Mont Tremblant — and stop in charming towns like St-Sauveur, St-Adolphe d’Howard and Mont-Tremblant. Discover lakeside villages, take a cruise on Lac des Sables, and stop for photo ops of the stunning foliage. When you’re not with your guide, learning about the area’s history, you’ll have free time to eat, shop and walk around. Depart Montreal in the morning for your day trip to the Laurentian Mountains (Les Laurentides), one of Montrealers’ favorite getaway spots. Your first stop is the village of St-Sauveur, where you’ll be charmed by its cute main street lined with boutiques, cafes and shops. Enjoy one hour of free time here to browse the shops for souvenirs, admire the town’s historical buildings or enjoy a cup of coffee. After meeting back up with your guide, make your way to the next village, St-Adolphe d’Howard, about 20 minutes away. Stop here briefly for a photo op of Lac Joseph before continuing about 30 minutes down the road to the village of St-Agathe-des-Monts. When you arrive in town, head to the lakeshore to board a boat — the Croisieres Alouette — for your 50-minute cruise on beautiful Lac des Sables, one of the most picturesque lakes in the Laurentians. Finally, head to the last stop of the day, Mont-Tremblant, about half an hour away. On your way to Mont-Tremblant, your guide will give you a short introduction to the village and adjacent ski resort of the same name, including facts about the resort’s founder, Joseph Ryan, an American who came to the mountain looking for gold. When you arrive, you’ll have three hours of free time to eat, shop, walk around the village and take advantage of the alpine sightseeing activities, such as riding the gondola up to the top of Mont Tremblant, the highest peak in the Laurentians. Perhaps you want to linger over a long French lunch with good wine, or just grab a sandwich before discovering what's happening in the village that day; events often take place, such as the Tremblant International Blues Festival (all food, drinks, activities and events at your own expense). Finally, make the two-hour drive back to Montreal, where your day trip ends.